Gandhinagar: Gujarat Chief Minister Vijay Rupani today gave in-principle approval for the Rs.39-crore ‘Seema Darshan’ project for developing more infrastructure facilities from T-Junction to Zero Point at Nadabet near Suigam in Banaskantha district for border tourism. Presiding over the Seema Darshan Review Meeting at Gandhinagar, he said the project being developed on Wagah Border pattern, entails an exhibition hall and a parade ground with amphitheater for 5,000 people. The meeting decided to send a proposal to the Union Home and Tourism Ministries for financial assistance. He said the phase-1 of the project worth Rs.22-crore was launched on December 24, 2016. Nearly 1-lakh tourists-youth have already participated in watching the border in an atmosphere surcharged with excitement at Seema Darshan. The viewers can watch the border where the Gujarat’s seacoast meets the landmass. 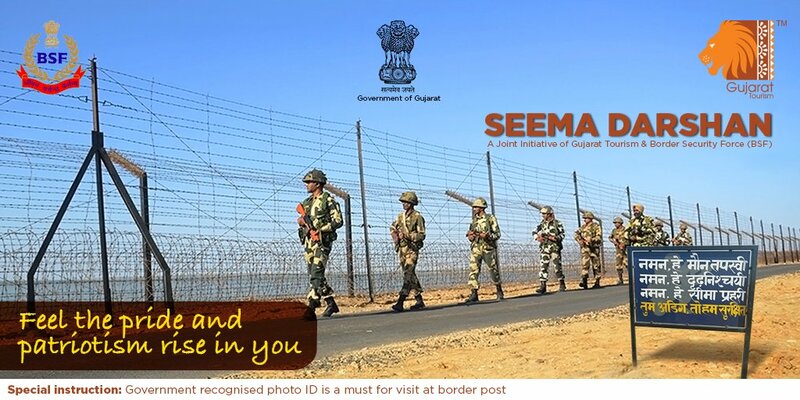 The project demonstrates our BSF jawans’ tryst with protecting the border as round-the-clock sentinels. The review meeting was attended by Tourism Minister Ganpat Vasava, Chief Minister’s Chief Principal Secretary Kailashnathan, Principal Secretary Tourism S. J. Haider, BSF IG Ajay Tomar, Roads & Building Secretary Vasava, Tourism Corporation of Gujarat Limited MD Jenu Devan and other senior officers.